(CORPAC, Peruvian Airports and Commercial Aviation Corporation) recorded the incident in an official document. With regard to the alleged sighting of the UFO flotilla in the Jorge Chavez Internationa Airport's airspace, ufologist Mario Zegarra says CORPAC filed official documents recording the incident, which hindered air oeprations that evening. According to Zegarra, there are recordings capturing conversations between the control tower and those pilots unable to take off or land in the airport for at least three hours. "The radar at Jorge Chavez captured 12 unidentified contacts on its screen, each identified with code 0000 for UFO," said Zegarra. Another ufologist, Joshue Cornejo, says that a UFO was recorded at 7:38 that evening using night vision equipment. 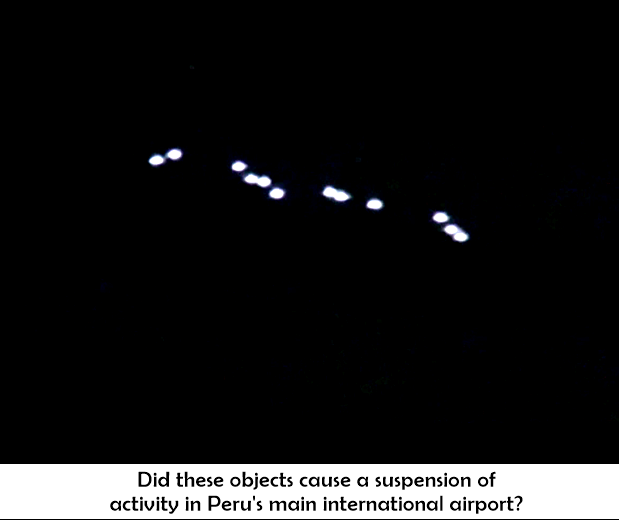 "These objects cannot be seen unaided," Cornejo noted, but can be captured on the infrared band." UFO specialist Mario Zegarra will hold a conference on March 11th in Miraflores.